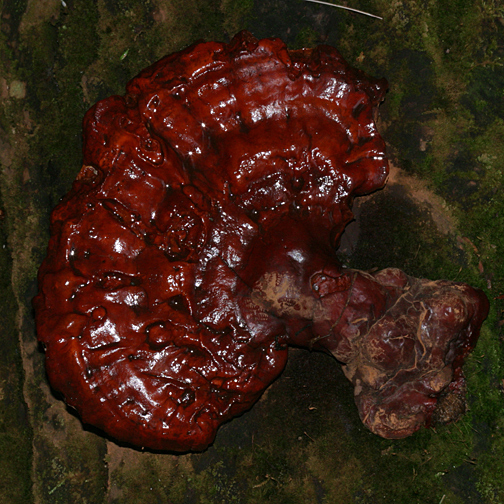 Here's the type of fungus these beetle larvae were in, Ganoderma tsugae. Any idea how many were in there? And did you take the entire fungus home or just some pieces? I think there were more, but when the fungus was first found, and ripped open, I didn't take it with me. I went back a week later and brought it home, and some might have died from exposure to the cold. I'm not sure how many were in there to start, but I just tore through the whole thing, and found just these 2. I've seen this conk type only once. I plan to visit the site where I saw it and check for beetle larvae. btw, those small, old, dark, hard conks we saw (and I collected) had at least four species of beetles living in them.